Ronnie Green has a big vision for UNL research. He sees world-leading research in water and food security, early childhood education, national defense, and materials and nanoscience. He sees the university as a distinctive member of the Big Ten and one of the country’s top 35 public universities. “We are going to be bigger, better and more impactful than ever,” said Green, who became UNL’s 20th chancellor in May 2016. Green knows UNL research. Twenty-two years after earning his doctorate in animal genetics from Nebraska, he returned in 2010 as vice chancellor of the Institute of Agriculture and Natural Resources and vice president for agriculture and natural resources for the University of Nebraska system. 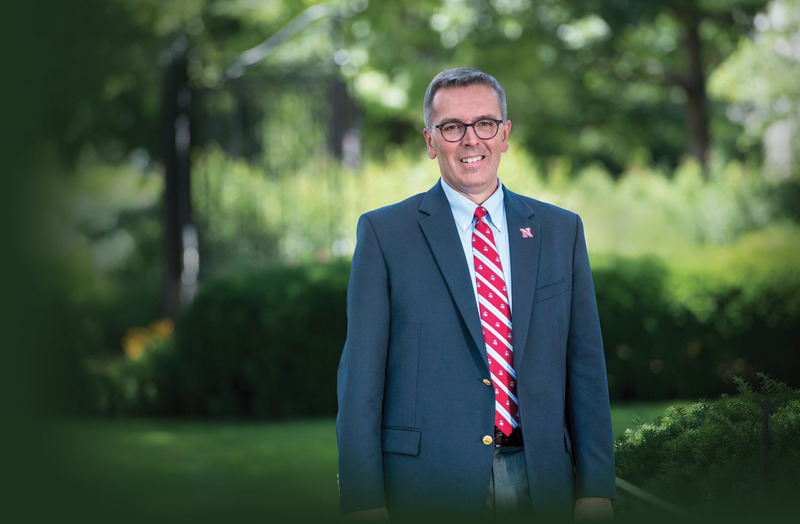 In 2015 he added the role of interim senior vice chancellor for academic affairs. Green’s ambitious 2025 goals include doubling research expenditures, increasing enrollment to 35,000 from the current 25,000, graduating students faster and building more private sector partnerships. Expanding collaborations with the University of Nebraska Medical Center, which Green calls Nebraska’s “other flagship campus,” is one strategy. UNL research expenditures currently are $278 million and, combined with UNMC, total $407 million. Green thinks the two campuses together can reach $800 million in 10 years or less. “I’m convinced that the opportunities are there to make it happen,” he said, citing the new NU systemwide food for health initiative, research on preventing obesity-related diseases and potential collaborations on health care design and delivery. “An area of great promise where we already are taking a lead is the microbiome,” Green said. UNL’s strong research programs across the spectrum of plant, animal and human microbiomes have earned significant grants from the U.S. Departments of Energy and Agriculture, the National Institutes of Health and the National Science Foundation. While research is critical to Green’s goal for UNL to be a distinctive member of the Big Ten, it’s only part of the equation.